The Pathfinder Campaign consists of 3 unique challenges in a maze-like setting. You can choose between hard and easy for each level, although my intention was to make the easy mode a little more challenging than the original TH campaign, and the hard version is meant for experts. I've tested each level, but let me know if you have suggestions about anything! This is my wishlist for how a level editor of the future should look like! I always get some ideas when I am bored and just wanted to share them. I put new suggestions in italic. The whole thing should be accessible from the start menu. When you click it, the map editor will open. everything that is under staff configuration in the level file. Training, happiness triggers, salaries, staff avaibility.. Optional features: if they need to go to the toilets, if they get thirsty and buy drinks or coffee (a coffee machine in the staff room would be nice.). Maybe even a cafeteria, where they will go after the staff room. I think for some levels it could be nice to have a big staff area with a staff room, cafeteria, research and training, but it should be optional. amount of time before he dies. He will also leave quickly if he is unhappy. do anything about it. Instead, a handyman should be needed to repair it. Enabling this will make a power supply available as an extra room. The more machines you have, the more it will cost monthly. If you have many machines, you may need a second one. Needs maintenance of a handyman, otherwise your machines will stop working. It won't blow up. [ x ] Soda machine breakdown: as suggested by Grimdoc. [ x ] Toilets need to be cleaned: Else patients will get unhappy or stop using the toilets. also affected by tolerance for litter. [ x ] Patient breakdown: a patient breaks down in the corridors and requires immediate attention. In this case, the level has 3 diseases. Helvetica Scenario appears more often than other diseases, but it can only come from emergencies. +you should be able to drag them in the right position. Low in the list will be researched later. With an exception: using the autopsy will start research on this disease. One thing that would make an awesome new challenge: If you could take any saved game and make a new level out of it, so that all the rooms, hired staff, patients, litter and everything is already there. So you get a miserable hospital and have to improve it. You lose, if your hospital is worth less than $150.000 after 4 years. Treat 20 emergencies (cure all of them). You lose, if you kill 5 emergency patients. You must employ 15 consultants. You must have at least 20 beds in the ward. Sell 1000 cans of soda. Research drug efficiency to 100%. Research all machines and improve them to maximum. I think this is the longest post I have ever written in a forum. This place really doesn't seem like a legitimate hospital. There are only a few windows and it smells of mold. Well, you had to choose between this or an abandonded school which now serves as a toxic-waste dump and is rumored to be inhabited by ghouls. You don't need to worry about your reputation, but don't be too careless! You got yourself only the cheapest drugs and machines. You will also find that trained doctors are rare and expensive around here. Finally, if you don't want your business closed down, stay out of trouble with the loan sharks! They're your only option. 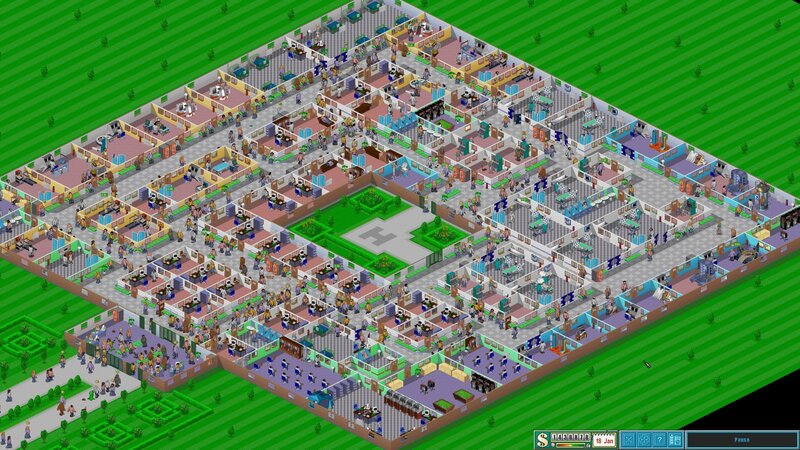 Just a big hospital with an amazingly creative name and a simple quadratic layout, which is easy to build in. You have enough space to handle alot of patients.